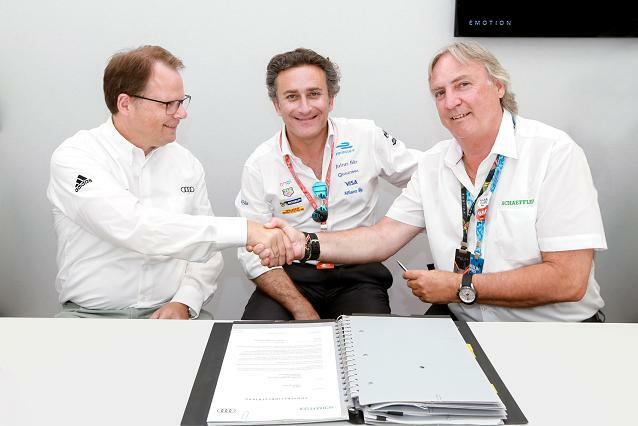 Audi and Schaeffler have signed a long term agreement on the development of electric power trains for energy-efficient Formula E racing cars. During the German home round of Team ABT Schaeffler Audi Sport in Berlin in June, Schaeffler and Audi agreed on an extensive cooperation in the development of the powertrain for the next three generations of the Formula E racing car. Schaeffler Chief Technology Officer Prof. Peter Gutzmer and Peter Mertens, Member of the Board of Management, Technical Development AUDI AG, signed a three-year agreement in Berlin-Tempelhof. Schaeffler has been involved in the innovative electric racing series from Day One and designing, developing and building the powertrain for the only German Formula E race car in the international field in a highly committed and successful partnership with Team ABT since the 2015/2016 season. In the light of AUDI AG entering the series with a factory-backed commitment as of the fourth season beginning in Autumn of 2017, Schaeffler and the Ingolstadt-based premium brand on the occasion of the race weekend in Berlin sealed a three-year technology cooperation up to and including the 2019/2020 season. The partnership will include joint work on the electric motor, suspension and power electronics for the powertrain. The basic concept for the next-generation powertrain of the Formula E racing car has been finalised and some of its components are already being tested. Behind the scenes, Schaeffler and Audi have been working together in Formula E in some areas before. Now, the official signing of the agreement elevates this existing active partnership to a higher level with a long-term focus. “We are delighted to have now sealed for the next three years this increasingly closer partnership that we have been actively engaged in with Audi in Formula E for quite some time. Just like we have been innovatively cooperating with Audi for many decades both in motorsport and, of course, in the development and manufacturing of components for production cars, I am sure that both partners are going to give their best to this joint effort and will continue the success story of ABT Schaeffler Audi Sport which is already an impressive one,” says Schaeffler’s Chief Technology Officer Prof. Peter Gutzmer. Apart from their freshly sealed cooperation in Formula E, Schaeffler and Audi have been partners in the DTM since 2007 – in 2011 (Martin Tomczyk) and 2013 (Schaeffler ambassador Mike Rockenfeller), the DTM Champions drove a green-yellow Schaeffler Audi. As its third major motorsport pillar, Schaeffler has a commitment in the FIA World Endurance Championship (WEC) high-tech racing series with Audi’s sister brand Porsche. The WEC – similar to Formula E – features forward-thinking motorsport subject to regulations focused on energy efficiency. Just as Schaeffler has been contributing its technology expertise to Formula E since Day One, the technology group is also a pioneer in electric mobility for the road. For two decades, Schaeffler’s research and development departments have been active in this field. More recently, the development team dedicated to components for electric vehicles has doubled in size and has direct access to know-how from the race track for its projects. Schaeffler now offers a wide range of products for electrifying the entire powertrain, from starter-generators, to 48-Volt systems, through to wheel hub motors and E-axles. In addition, Schaeffler is developing electric vehicle concepts below the level of the automobile for mobility of tomorrow. These include the Bio-Hybrid – a four-wheel Pedelec with weather protection – and the E-Board for urban areas. On both a large and small scale, “The Formula E commitment helps us gain a better understanding of the electric mobility environment and systems,” says Prof. Peter Gutzmer.